On top : A Sketch from 1870 showing a Restored Version of the Temple. The Martand Sun Temple (मार्तंड सूर्य मंदिर) is a Kashmiri Hindu temple dedicated to Surya (the chief solar deity in Hinduism) and built during the 8th century CE. Martand is another Sanskrit name for the Hindu Sun-god. 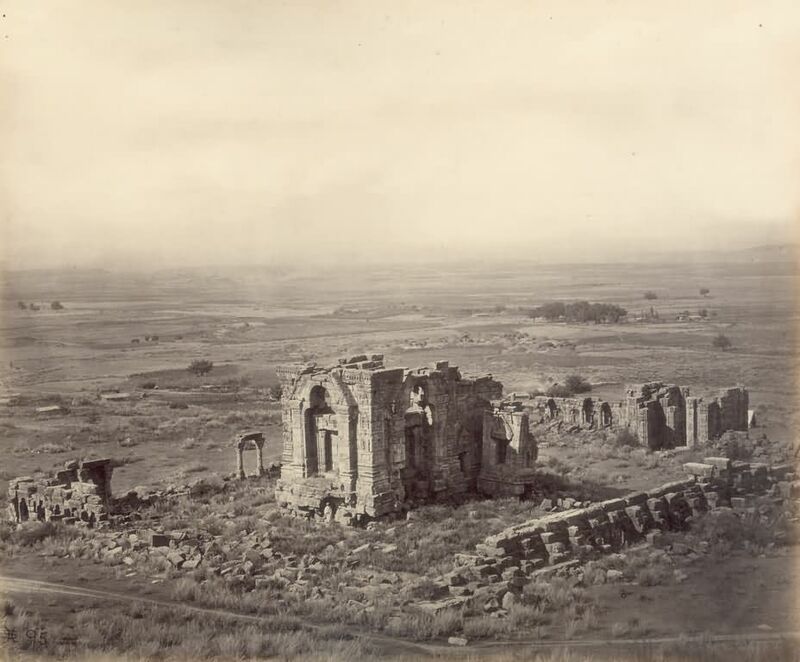 Now in ruins, the temple is located five miles from Anantnag in the Indian state of Jammu and Kashmir. The Martand Sun Temple was built by the third ruler of the Karkota Dynasty, Lalitaditya Muktapida, in the 8th century CE. It is said to have been built during 725-756 CE. The foundation of the temple is said to have been around since 370-500 CE, with some attributing the construction of the temple to have begun with Ranaditya. The Temple is said to have been destroyed by Sultan Sikandar. Of course this was one of the grandest Temple structures in the Kashmir Valley and its ruins are still quite impressive. 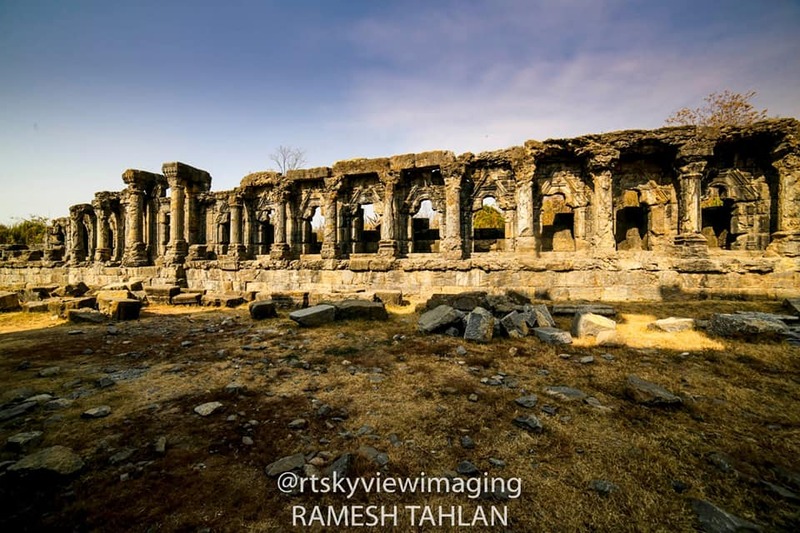 In my view the most impressive ruins of Temples in Kashmir are the Martand Temple, the Temples at Naranag and the ruins at Parihaspora and all these were built by the Lalitaditya who was one of the greatest Kings of Kashmir. This Temple got a lot of coverage when it was covered in the Movie “Haider” and a particular song in the movie was picturised at the same site. Of course this has aroused people’s interest in the Temple. Presenting some images on how the Temple looked in its original format, another pic taken in 1875 and another by Ralph Stewart in 1912. And finally a pic taken last year by my friend Ramesh Tahlan. A pic by Ralph Stewart from 1912A corresponding pic to the above pic from the present day. Of course it is clear that the Temple in its original format was just mind blowingly awesome. And the pics from 1875 and 1912 show the neglected and almost half buried in the Ground. It is pertinent to note that during the Dogra Dynasty was ruling Kashmir and of course restoration of old Temples was never high on their agenda. Infact Auriel Stein had noted that stones from the Parihaspora ruins were being used to build the Jehlum Cart Road. It was only when Auriel Stien bought this to the notice of the British Resident that the Maharaja was requested to spare the ruins and the Maharaja agreed. As is clear from the pics a lot of work seems to have been done in the last Century. All of the main structure has now been excavated. The Stair cases were all buried if you notice the pics from the turn of the last Century. They are now prominent. Same way many structures which were earlier totally buried are now excavated and the whole site looks in a much better shape to be honest. A pic by Ralph Stewart from 1912 of the main Temple structure. Note that the Stairs are buried under the Mounds.Corresponding to the above pic a Pic from the present day giving you an idea of how much excavation has been done in the said area. The photos if Temple ruins from Kashmir always evokes a strong emotion in people. I always like to tell them two things. Temple ruins are dotted all over India and not only Kashmir. And secondly history is not as linear as we tend to assume. The reasons for the the present state of a historical site are multiple and not a single reason. So I always recommend that we cherish and preserve what we have instead of constantly bemoaning the state they are in and starting a blame game.